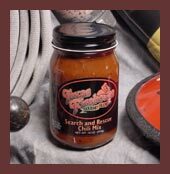 Peel 4 avocados, slice and mix in 1/2 jar of Texas Firehouse Picante Sauce, stir together, squeeze lime juice over top, ready to serve. Brown ground beef in skillet, drain excess oil. Pour Picante Sauce into pan with ground beef and simmer for 30 minutes. Fill taco shells with meat and picante mixture and add lettuce, tomatoes, cheese or other toppings as desired. Place tortilla chips on microwave safe platter. Spread with refried beans, sprinkle with cheese and Firehouse Jalapeño Flashover. Microwave on high until cheese is melted. Serve immediately. Brown chili meat and drain excess oil. Add onion (optional). Add a jar of Search and Rescue Chili Mix and a jar of water. Simmer for 15 minutes and serve. Preheat oven to 350° F. Brown meat and drain (or boil chicken breast and shred). Combine meat with 1 cup shredded cheese. Heat about 1/4 inch of oil in a small skillet. Dip each tortilla into the oil for 5 seconds per side. Place meat and cheese mixture into tortilla and roll tortilla up. Place seam-side down in a baking dish. Repeat until all filling is used. Pour Texas Firehouse Chili Mix over the top, sprinkle with remaining cheese and bake 30 minutes. Garnish with black olives, sour cream, and avocados if desired.